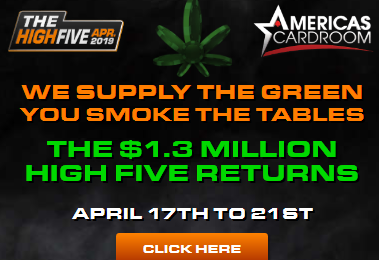 Americas Cardroom has scheduled their 4th HIGH FIVE Poker Tournament Series this April, starting on Wednesday April 8th. 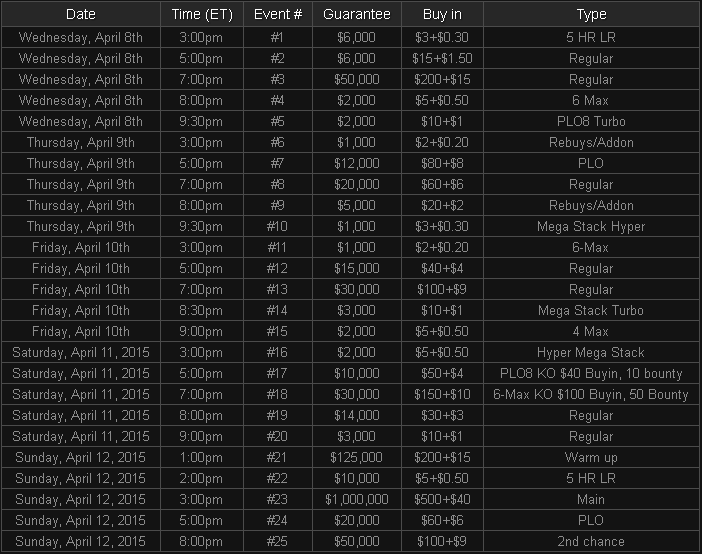 25 total events are scheduled, there will 8 events with buy-ins of $5.50 or less and it all finishes with the April 12th Million Dollar Sunday. As usual, there are poker tournaments of every format you can think of and there is a tournament to fit your specific playing expertise. Americas Cardroom has set the bar extremely high on this Poker Tournament Series. The first Million Dollar Sunday on ACR in February, 2015 paid out the $1 million dollar prize pool with only a slight over-lay and the April High Five – Million Dollar Sunday Event is expected to exceed over $1 Million Dollars in total prizes paid out. Americas Cardroom offers a 100% Deposit Bonus for all new players and has the most liberal Bonus redemption plan ($1 for $5 in rake) available to online poker players. In case you missed it, ACR introduced their all-new FREEBUY Tournaments on March 16th to start the ball rolling towards these April High Five Tournaments. San Jose, Costa Rica – March 4, 2015 – Though February was the shortest month of the year it didn’t stop Americas Cardroom (ACR) from having its biggest month ever. ACR delivered on its promise to players to host Winning Millions, the online poker site’s $1,000,000 GTD poker tournament as a finale to their biggest online tournament series to date. As a result, overall player traffic in cash games and tournaments has reached record numbers throughout February for the US-facing online poker room. Since the beginning of 2015, ACR has aggressively added tournaments and satellites to its schedule with major appeal to all player types. On top of their weekly $50k GTD Sunday major, ACR added another $200+$15 buy-in Sunday Special tournament with a progressive guaranteed prize pool that increases every week the tournament covers. The tournament started as a $35k GTD but has already spiraled up to a posted $70k GTD for this upcoming Sunday. Smaller stakes players are getting into the action as well. This past Sunday, ACR hosted a $25k GTD buy-in with the low buy-in of just $15+$1.50. Not only did the tournament cover, but it well surpassed the guarantee by reaching over $33k from buy-ins. Americas Cardroom has already put some stakes in the Vegas ground. Players who want to participate in the 2015 World Series of Poker Main Event can also now win their package on ACR. ACR has promised to send at least 50 of its players to Las Vegas via weekly satellites. Online poker players can win a $12,500 package for just $55 every Sunday. ACR has indeed shown no signs of slowing down. They just announced that they will be hosting yet another $1,000,000 GTD on April 12th at 3:00 pm ET. This time, ACR has renamed the tournament “Million Dollar Sundays” instead of “The Winning Millions”. The title says it all. ACR’s intentions for the future are clear. Visit ACR Now to get in on all the easy to join and exciting online poker action today.